Haubstadt, Indiana………For Dave Darland, there aren’t many things that one could say would surprise him. After all, the man’s seen it all and done it all in USAC AMSOIL National Sprint Car racing throughout his storied career. However, Saturday night in the NOS Energy Drink “Indiana Sprint Week” finale, “The People’s Champ” did something that surprised even himself – winning at Tri-State Speedway – a track that has proven to be a bugaboo in his craw over the past three decades. Meanwhile, the driver Darland passed to score Saturday’s 20th career ISW victory was none other than Chris Windom, who came into the feature cradling a 15-point lead over reigning champ Kevin Thomas, Jr., meaning a fifth-place finish or better would secure the ISW title regardless of what KTJ did, no questions asked, no fuss, no muss. Windom held the exclamation point for the bulk of the 30-lap main event from his outside front row starting spot. For a driver who astonishingly hasn’t won an ISW race or title since 2011, what better way to plant the flag of punctuational nomenclature than by winning the feature and being fitted for the crown on the same night. Chase Stockon dogged Windom like a Baskerville Hound as the two pounced toward lapped traffic by lap 10, Stockon did his dirty work through the middle while Windom scraped the lower groove in his Baldwin Brothers Racing/Fox Paving – AMSOIL/DRC/Claxton Mopar. Stockon was taking a peek around the outside of Windom when the first yellow flag fell for the stopped car of Daron Clayton in turn four. A restart near midway saw Windom and Stockon separated by the lapped car of Mario Clouser, one who had the speed to run the quickest lap of the race at the time and was able to race wheel-to-wheel with Windom until clearing the scene and gaining his lap back. A handful of laps later, Kokomo ISW winner Thomas Meseraull flipped nose-to-tail off turn four into the catch fencing while running ninth. He was okay, but not his car nor was Ballou’s ride, which experienced severe trauma on the front end. On the ensuing lap 19 restart, Darland surged from third to second past Stockon with a turn one slider. The race was on and here came pride up the backstretch in the form of the Goodnight Racing-Curb-Agajanian/Curb Records – The Pallet Builder/Maxim/Claxton Chevy. Darland sheared into Windom’s lead each trip around the quarter-mile dirt oval and, on lap 24, sharpened his blades and made the attack on Windom with a slider in turn one to snag the lead. “I honestly wasn’t expecting that big of a slider,” Windom recalled. “The track started moving around a bit. I started running the bottom in the first half and I felt like it was slowing down quite a bit. It’s tough leading here because you don’t really know where to go. I tried to get to the top, but Dave got by us and his car was really hooked up tonight. It was going to be tough to run him down and I don’t think I really had anything for him unless I really wanted to start pressuring him. I was looking at the big picture there and thought I was in a really good spot in second behind him. I just rode it out after I didn’t think I had anything for him. One lap later, on lap 25, Clouser’s car was found spun backwards close to the outside wall between turns one and two, just in front of the leaders. Windom had to take evasive action, but escaped without any harm. If being passed for the lead in the closing laps wasn’t enough of a Pepto moment for Windom, surely the final five laps following the restart would need a little relief. However, Windom had his CPU set on Expert Mode and remained in check, unfazed as he locked up the second spot with KTJ in fourth, enough of a point cushion to add Indiana Sprint Week titlist to his ever-growing resume. All the while, up front, Darland was putting the hurtin’ on the field, locking up his second victory in a three-day span for his record-extending 62nd career USAC AMSOIL National Sprint Car feature win. Windom finished second ahead of Stockon, K. Thomas and C.J. Leary. 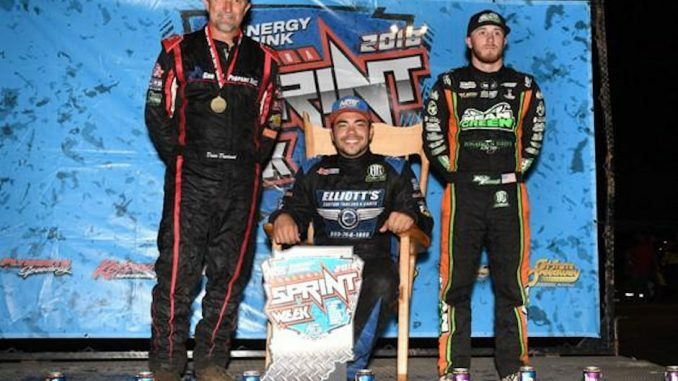 Windom followed up June’s “Eastern Storm” title with a NOS Energy Drink “Indiana Sprint Week” championship in a little in over a span of a month to become just the third driver to accomplish both tasks in a single season (Bryan Clauson in 2013 and Robert Ballou in 2015). Windom was rewarded with a $5000 first-place prize check for winning ISW, plus his second custom, hand-made Bridgeport Rocker courtesy of John and Terri Youngs of Vincennes, Indiana. Contingency award winners Saturday night at Tri-State Speedway were Kevin Thomas, Jr. (Bell Helmets Fast Time Award), Thomas Meseraull (Simpson Race Products First Heat Winner), Tyler Courtney (Competition Suspension, Inc. Second Heat Winner), Stephen Schnapf (Chalk Stix Third Heat Winner), Chris Windom (Indy Race Parts Fourth Heat Winner), Brady Bacon (KSE Racing Products/B & W Auto Mart Hard Charger), Carson Short (Wilwood Brakes 13th Place Finisher), Daron Clayton (Roger & Barb Tapy 13th Fastest Qualifier) and Scotty Weir (Saldana Racing Products First Non-Transfer). BELL HELMETS QUALIFYING: 1. Kevin Thomas, Jr., 69, Dynamics-13.378; 2. Chad Boespflug, 11p, Pottorff/Short-13.593; 3. Justin Grant, 4, TOPP-13.605; 4. Chase Stockon, 32, 32 TBI-13.639; 5. Dave Darland, 36D, Goodnight/Curb-Agajanian-13.663; 6. Kyle Cummins, 3c, EZR/Cummins-13.720; 7. Josh Hodges, 74x, Hodges-13.740; 8. Chris Windom, 5, Baldwin-13.752; 9. Brody Roa, 91R, BR-13.760; 10. Tyler Courtney, 7BC, Clauson/Marshall/Newman-13.789; 11. C.J. Leary, 30, Leary-13.827; 12. Shane Cottle, 5G, Goacher-13.830; 13. Daron Clayton, 5o, Schmidt-13.837; 14. Timmy Buckwalter, 7, LNB-13.846; 15. Jarett Andretti, 18, Andretti-13.856; 16. Tony DiMattia, 50, TDM-13.897; 17. Thomas Meseraull, 5B, Briscoe-13.923; 18. Kendall Ruble, 17K, Ruble-13.955; 19. Stephen Schnapf, 61m, Edwards-13.973; 20. Mario Clouser, 6, MCM-14.046; 21. Scotty Weir, 17G, On The Gass-14.066; 22. Chet Williams, 38, Williams-14.079; 23. Brady Bacon, 99, Bacon-14.083; 24. Jake Swanson, 92, Sertich-14.100; 25. R.J. Johnson, 19, Reinbold/Underwood-14.109; 26. Clinton Boyles, 19AZ, Reinbold/Underwood-14.114; 27. Isaac Chapple, 52, LNR/Chapple-14.126; 28. Dakota Jackson, 3, Jackson-14.127; 29. Robert Ballou, 12, Ballou-14.144; 30. Brandon Mattox, 2v, Fitzpatrick-14.201; 31. Critter Malone, 7c, Seven-14.219; 32. Kody Swanson, 23, Karraker-14.274; 33. Collin Ambrose, 36, Ambrose-14.289; 34. Carson Short, 21, RCM-14.309; 35. Aric Gentry, 10, Gentry-14.331; 36. Brandon Morin, 98, Morin-14.373; 37. Donny Brackett, 4B, Brackett-14.495; 38. Kent Schmidt, 5K, Schmidt-14.698; 39. Brian Wallace, 27, Wallace-14.776; 40. Alec Sipes, 99s, Sipes-15.042; 41. Travis Thompson, 28, Mattox/Nigg-14.841; 42. Robert Bell, 71, Bell-15.498. **Jackson flipped during the semi. Meseraull flipped on lap 18 of the feature. FEATURE LAP LEADERS: Laps 1-23 Windom, Laps 24-30 Darland. NEW USAC AMSOIL SPRINT CAR NATIONAL CHAMPIONSHIP POINTS: 1-Windom-1741, 2-K. Thomas-1733, 3-Courtney-1687, 4-Stockon-1502, 5-Bacon-1490, 6-Darland-1484, 7-Leary-1431, 8-Ballou-1407, 9-Grant-1387, 10-Boespflug-1074. FINAL NOS ENERGY DRINK “INDIANA SPRINT WEEK” POINTS: 1-Windom-500, 2-K. Thomas-479, 3-Darland-442, 4-Leary-437, 5-Courtney-427, 6-Stockon-416, 7-Bacon-410, 8-Grant-379, 9-Meseraull-292, 10-Short-291.